i have this problem with the game: I press button battle- game is loading, loaded. Battle begins and i drive a few metres and the game is closing. I try to log in again. So i am at the battle again and ahain the game is shutting down after few seconds in battle. http://prntscr.com/ewds5e -Few seconds, then wot closed by itself. My launcher can't seem to update WoT to the newest 9.18 patch. I've tried everything but it still won't work. Please help. Disappointed in Arty not being able to platoon anymore. I usually play only when family is on and we mostly play Artillery (my dad likes it). By making this change we can no longer play WoT the way we want. I read some of the reasons you did this, and you might as well make it so T-127's can't platoon, or T-59's, or E-25's. Edited by Hawk42, May 05 2017 - 02:04. ​That was about the same as what my experience was to it all. I have this to add. I have not been able to open wows or wowp with out the WGC working so more time for tanks . I would add that when I removed WGC I got my friends list back in wot. Wargaming I have just one question for you. Why is there no towing function in the game? do you have any idea of how many players have died because they got stuck, and that most if not all of these deathes could have been prevented if you had just added such a tiny and simple function to your game? btw if you do reply to this wargaming send me a message on XBox Live. Edited by Kaguya_Mikaru, Jul 10 2017 - 17:46. I was not able to take a screen shot. Pressing "Prt Scr" and "Alt + Prt Scr" while in game yielded no results. I was able to paste nothing into MSPaint. I am writing regarding Bonds, Gold, Credits, and Free XP menus at the top right corner of the garage in game. Each menu is labeled "Earn", "Purchase", "Exchange", and "Convert". These menu names are misleading as they tell you what you can with the numbers, but not what the numbers actually represent. With all due respect, a little common sense would dictate that the menus should be labeled, "Bonds", "Gold", "Credits", "Free XP". Even when you hover your mouse over each field, you STILL aren't given a description of what the numbers mean. The person who designed these menus has been playing the game too long and is thinking inside the box. If you designed the interface by closely listening to user feedback, "Earn", "Purchase", "Exchange", and "Convert" would have been at the bottom of the list of names to write on the screen in these fields. There should be a consistent interface where if I hover my mouse over something in game, I should generally be given specific information about what the item I'm hovering over actually is. I should not immediately be given the marketing team's banter about what they want me to do with my bonds, gold, credits, and free XP. Please replace the labels "Earn", "Purchase", "Exchange", and "Convert" to "Bonds", "Gold", "Credits", and "Free XP" or something meaningful that tells everyone at a glimpse what the numbers represent. Lots of glitches on every map and vehicle I use since most recent update. but i have dmged 8 enemies in the game,and NOONE has more hits(i have look after battle and make pics of it) but at the end of game i dont have the confederate medal. 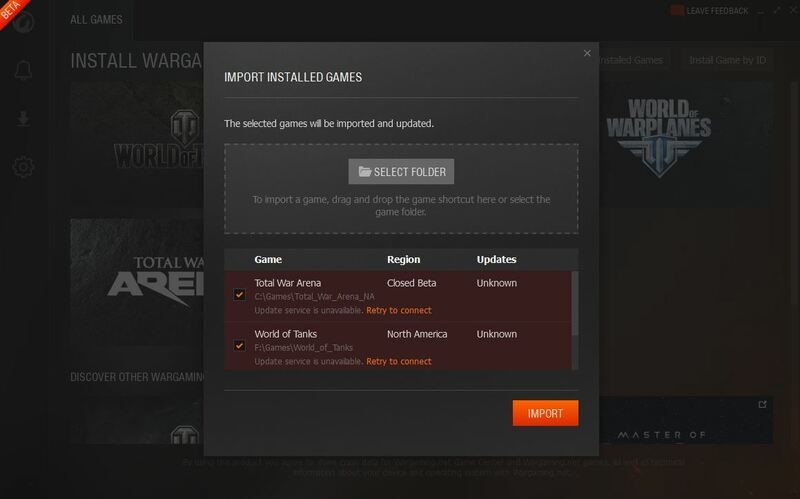 As soon as I installed WGC I started having this issue where none of the games can connect to the update service regardless of the fact that I have disabled my firewall and given permissions. I'm running Windows 10 and have a very reliable internet connection and have played world of tanks/warships recently before attempting to use WGC. My problem is that as soon as an update on the WG Game Centre start downloading, for WoT, WoWP and WoWS, my internet disconnect. What happens is that WGGC tell me it cannot connect to internet. Then I cannot connect to any DNS connection ie WG servers etc. Then I need to go to Command Prompt, IPconfig flush DNS. Once completed I need to at new IP adds 8.8.8.8 and 4.4.4.4. I have tried every setting in my windows firewall and my antivirus programme, that will allow WGGC to work. Thus it got preference and allowances for connections. But to no avail. Everytime there is an update downloading, my internet crash. First time this happened I spend 2 hours with my internet supplier to try and sort problem out. It is no use supplying pingplotter data or battle reply as it is not the line or your servers that is the problem. Interesting is that I can still play the games - even with the DNS down. I have uninstalled and reinstalled WGGC many times - using different combinations - but as soon as WGGC is connceted and update come - I loose my internet connection. I have tried the WG problems solver solutions - but to no avail. please advise how I can stop this problem. I would like to ask for a boost to the IS6 penetration, 175 pen for a tier 8 is just sad! Add some puncuation instead of one long sentence. Check a few words for spelling and what I think are a few missing words and get back to us. * My mistake. There is 1 period. So 2 long sentences are in there. Edited by Taggeth, Oct 23 2017 - 19:20.